This section comprises Garden Entrance 2, a nursery, Miombo Woodland, African Rain Forest and the Biodiversity Education and Empowerment Centre. The enchanting African Rain Forest, with its singing cicada beetles, lures visitors deep into the trees through the SAPPI aerial boardwalk. There, the forest canopy seems to be within reach. The suspension bridge links the Visitors’ Centre to the main Garden. 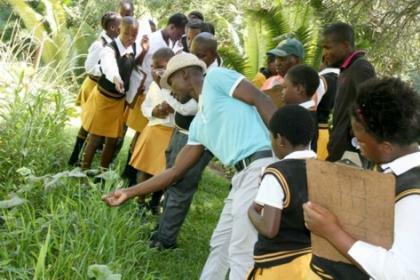 The Biodiversity Education and Empowerment Centre offers various environmental programmes to schools. These programmes contribute immensely to the greening of the environment. Miombo is the Swahili word for Brachystegia, a genus of trees comprising a large number of species. 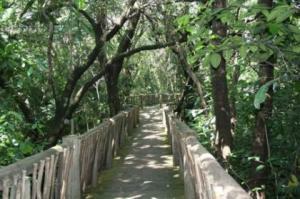 Miombo Woodland is classified in the tropical and subtropical grasslands, savannas and shrublands biome. This biome is characterised by the presence of Miombo species, which produce a flush of new leaves just before the onset of the rainy season. The rich gold and red colours mask the underlying chlorophyll, reminiscent of temperate autumn colours. The bark of Brachystegia spiciformis (musasa) contains tannin which is used as the final dressing in tanning hides. This gives the characteristic reddish colour to the finished product. An infusion of the roots, on the other hand, provides a treatment for dysentery and diarrhoea. A decoction is applied as eyewash in cases of conjunctivitis. The wood of the Guibourtia coleosperma (large false mopane) is attractive with a soft pink brownish colour and is commercially known as umchibi. The seeds and arils are used for food. Sterculia quinqueloba (large-leaved star chestnut) grows on rocky koppies and hill slopes. This is a conspicuous tree with a pale, almost white trunk. The wood, however, is reddish brown and is sometimes used for furniture. 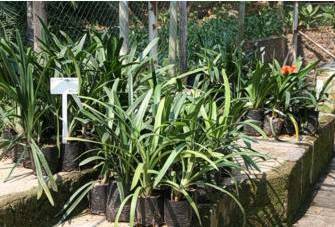 Visit SANBI’s plant information website for information on the plants in our Garden and more. This section contains a unique collection of some of the plants from the rapidly disappearing tropical forests of Central and West Africa. A complete ecosystem has been recreated here, from the high forest canopy, to the thick layer of herbaceous plants on the forest floor. 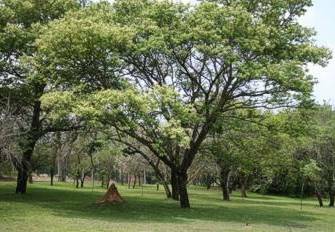 The Chrysophyllum gorungosanum (brown-berry, fluted-milkwood) can grow up to 45 m while Khaya anthotheca (red mahogany) grows up to a whopping 60 m. Funtumia africana‘s (silk rubber) latex has been used as bird lime. Oricia bachmannii (twin-berry tree) and Maesopsis eminii (umbrella tree) provide berries to birds and mammals and an infusion of the bark can be drunk to relieve colds. In certain parts of Africa the stems are used to make dugout canoes. The colour of the wood is reddish with a handsome grain and is thus suitable for making furniture. The suspended bridge (SAPPI Aerial Boardwalk), which runs from the African Rain Forest, connects the Garden with the Visitors’ Centre. 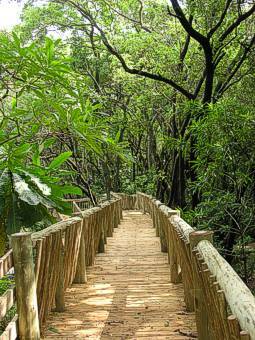 The boardwalk is one of the main attractions in the African Rainforest. It takes visitors 4 m up into the canopy of the Rain Forest, providing a bird’s-eye view of this interesting tropical area of the Garden. The construction of this aerial board was made possible by a substantial donation from SAPPI. Hippos caused irreparable damage to the ground level boardwalk which necessitated the building of this aerial boardwalk.